Oscar Nominees Maggie Gyllenhaal and Viola Davis lead a stellar cast in this empowering drama inspired by actual events. Hard-working single mom Jamie Fitzpatrick (Gyllenhaal) is concerned that John Adams Elementary is letting her daughter down. Teaming with a caring teacher (Davis) who wants the best future for her own son, she sets out to improve attitudes and elevate the school’s academic standards. Despite the odds, with courage, hope and persistence, the women just might prevail in this uplifting film that also stars Rosie Perez and Academy Award Winner Holly Hunter. This movie just had me in awe. When I first learned about this filmed I looked everything up about it and the real story behind it. I was bummed to not be able to see this film in theaters, but when I had the opportunity to review this and share my thoughts with you guys I was more than thrilled. 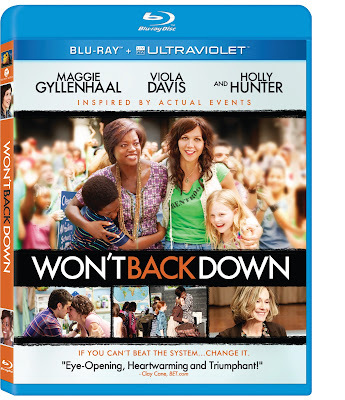 Won't Back Down is not only inspiring, but it gives you hope. I laughed, I cried, there were so many emotions going on as I watched this film. This just made me thankful for some of the teachers I have come to love and respect when I was younger and today as a parent. Viola Davis has done it again with this amazing performance, she just keeps getting better and better and I've never seen Maggie Gyllenhaal play such an amazing and strong character. I highly recommend this movie if you're looking for some motivation. This just shows you that if you put your heart and soul into a cause you truly believe in, positive results will be waiting for you, just keep fighting! Disclosure: All opinions are my own. I received Won't Back Down on blu-ray at no cost for the purpose of this review. No other compensation was received.